As I approach the 5th anniversary of my implant (11/19), I wanted to share a spreadsheet I keep with a few numbers pulled from my interrogation reports. But what can I tell from the above data sheet? The impedance of my leads (as measured in ohms, Ω) has been within range. A sudden increase in lead impedance ( > 2000 Ω) may indicate a conductor fracture, while a sudden drop in lead impedance ( < 200 Ω) may indicate an insulation breach. What do you know about your device? I figured it would be useful to post this here since there are currently 79,000 patients in the U.S. with these recalled leads. If you have a Riata or Riata ST, I’d encourage you to stay informed and ask your doctor if he has a plan for the management of your leads. This manuscript became available yesterday. It’s an assessment of the deaths of patients with Riata and Riata ST leads that have been reported to the FDA in an attempt to determine if these deaths were due to lead malfunction. The analysis was done by Dr. Robert Hauser of the Minneapolis Heart Institute Foundation. The report claims 22 deaths caused by the St. Jude Riata lead failure. Dr. Hauser concludes that no deaths were caused by externalized wires, the problem most commonly associated with the Riata. Rather, the deaths were caused by short-circuits between high voltage components. This could prove ominous for the Durata lead as well. The Durata lead is currently being implanted worldwide and is not a subject of any recalls or confirmed externalizations. But it’s similar in design to the Riata, apart from its Optim insulation. Watch a St. Jude Medical video about the benefits of Optim insulation. Adverse events (deaths and injury) are voluntarily reported by hospitals and doctors into a public FDA database called MAUDE. Manufacturers are required to report deaths and injuries, however, there are an unknown number of delays in adverse event reporting by the manufacturer. So, adverse events reported into MAUDE is incomplete. By some accounts, only 5% of all adverse events are ever reported (watch Dr. Rita Redberg, UCSF, in this video at 16:57). Dr. Hauser believes the information in MAUDE is accurate but incomplete. His study classifies 50 deaths as indeterminate because important information was not reported (see page 22). He says that the number of deaths is likely being underestimated. We need the reporting of adverse events to be mandatory and for a public registry to be created in the U.S. with data flowing in from all remote monitoring platforms. It’s the only way for us to know for sure what's going on when there's a recall. Patients should have the right to access this information in a way that is timely and easy to understand. Deaths Caused By the Failure of Riata and Riata ST Cardioverter-Defibrillator Leads. This is the most ridiculous of all excuses. HIPAA is the Health Insurance Portability and Accountability Act passed by the U.S. Congress in 1996. HIPAA is the single most significant legislation affecting the health care industry since the creation of Medicare and Medicaid back in 1965. One of the reasons HIPAA was created, was to give patients control over the use of their health information. NOT to prevent us from having it. You heard the ridiculous, now you heard the top patronizing excuse. To that I say: try us! Excuse #3: Let us help you first. Paternalism at its best. How about putting it into meaningful context WITH patients? Having manufacturers put our data in context means that they get to spin it for us. That is not what we want. Just give us our damn data and let us partner with whomever we want: doctors, family, statisticians, researchers, other patients, app developers or our electrical engineer friends to make it meaningful. Plus, different patients have different needs and different levels of understanding. We’re all in different phases of the same journey. It’s our job to make our health information meaningful, not theirs. Excuse #4: It will overwhelm doctors with calls. Another patronizing excuse. I actually think that the exact opposite would happen. Instead of calling for every little thing, patients who are empowered with information and equipped with knowledge would only call their doctors for reasons that are important enough. Wouldn’t you? Excuse #5: Doesn’t fit our business model. In other words, “who’s going to pay for this?” or “why should we commit dollars to creating an infrastructure that provides data to patients when they don’t influence device purchase?” The doctor is the customer, in case you’re wondering. Not the patient. The issue of giving patients access to our data will only be settled when doctors start talking about this and demanding that their patients be empowered with information. Thankfully, this has already started to happen. Yay! 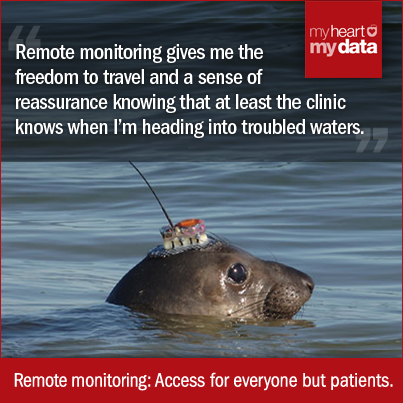 I’ve been on a journey to unlock data from my implantable defibrillator for over two years now. While I’ve had quite a few successes, nothing compares with the overwhelmingly positive response received after a video of my talk at TEDxCambridge went live last week. It was followed by an interview with Brooke Gladstone of NPR’s “On the Media” in which she asked: “Who owns the data from inside your body”? These two developments caused my inbox to overflow with offers from hackers (listen to the interview) and emails from NPR listeners from the UK, Canada, and the entire U.S. I was unprepared for such an overwhelming response. So, if you’re one of the people who wrote to me, please know what I will get back to you in time. This has been a wild and unexpected ride, but I wouldn’t have it any other way. Should patients have the right to inspect and scrutinize the software that runs the implantable devices that keep them alive? Karen Sandler thinks so. Karen is a lawyer, executive director of the GNOME foundation, and Hypertrophic Cardiomyopathy patient who’s received an implantable defibrillator for primary prevention of sudden cardiac arrest. In this talk, Karen explains how the FDA never reviews the source code that runs our ICDs and pacemakers and makes a case for free and open platforms for life-critical software.